Mickey Mouse: Emblem of the American Spirit tells the compelling story of how Walt Disney’s beloved graphic alter ego, the most enduring pop icon ever created, was born, how it soon took on a life of its own, and — as an often politically charged symbol of America — became an instantly recognizable figure virtually everywhere on earth. Mickey Mouse: Emblem of the American Spirit chronicles the life and times of Disney’s cheerful signature character, beginning with his lively syncopated debut in 1928 in Steamboat Willie at the tail end of the Jazz Age and into the Depression, and traces his impact on the realms of high art, literature, even politics — in peace and in war — both in the United States and abroad. 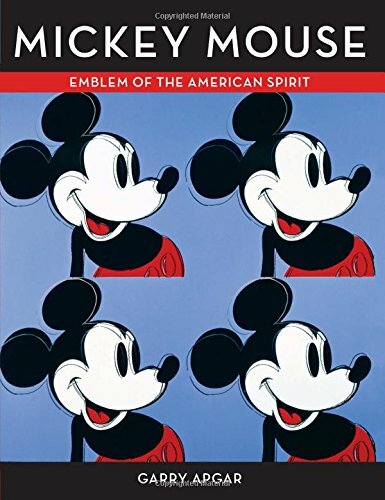 With over 300 images — many rarely or never before seen, most in full color —, Mickey Mouse: Emblem of the American Spirit is a worthy companion to Christopher Finch’s classic volume, The Art of Walt Disney. Join Garry Apgar and The Walt Disney Family Foundation Press for a fascinating look at the multiple ways Walt Disney’s iconic Mouse has impacted our lives, individually and as a society.